The palace is located in the heart of the island between the towns of Dambulla and Habarane on a massive rocky plateau 370 meters above the sea level. 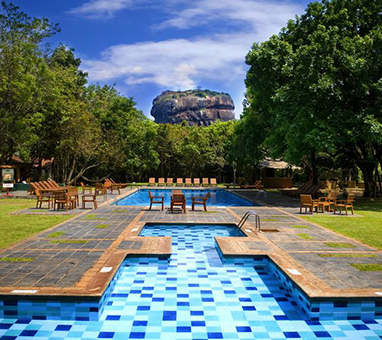 Sigiriya rock plateau, formed from magma of an extinct volcano, is 200 meters higher than the surrounding jungles. Its view astonishes the visitors with the unique harmony between the nature and human imagination. The fortress complex includes remnants of a ruined palace, surrounded by an extensive network of fortifications, vast gardens, ponds, canals, alleys and fountains. 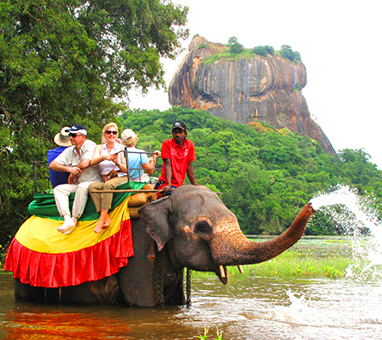 The surrounding territories of Sigiriya were inhibited for several thousand years. Since 3th century BC the rocky plateau of Sigiriya served as a monastery. In the second half of the 5th century king Kasyapa decided to construct a royal residence here. After his death Sigiriya again became a Buddhist monastery until the 14th century, when it was abandoned. The main entrance is located in the northern side of the rock. It was designed in the form of a huge stone lion, whose feet have survived up to today but the upper parts of the body were destroyed.